I’m just jerkin’ your chain! Yeah, Ward Bond acts in the most AFI films and he does play a cop here, but Humphrey Bogart is the story. This was Bogie’s big breakout (along with High Sierra that same year) and he lights it up. The man paid his dues for a while and played the heavy in 1930s films before they finally gave him the chance to be a leading man. Interesting that he often played shady “heroes”—including in The Maltese Falcon—rather than being straight-up nice-nice. 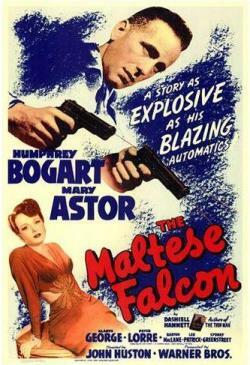 Bogie’s Sam Spade sees his partner get killed and he gains (and then loses) a love interest all in what seems like a few days. He also comes one phony statue shy of being a rich man. They all want that bird. Crooks all. Each of the villains in this piece is memorable: Sydney Greenstreet (debutting as Kasper Gutman), Peter Lorre (slimy and fey), Elisha Cook (weird, as always) and Mary Astor (constantly on the verge of hysteria or passing out). The last half-hour is tense, yet it’s just 5 people waiting around in a room. Writer/director John Huston (in his own breakout) didn’t change much from Dashiell Hammett’s novel, making him a smart writer/director. Apparently, the AFI agreed. They had it at 23rd and then 31st on their 2 Top 100 lists. They’re correct. This one is a honey. And Bogart is outstanding. He still had Casablanca and Treasure Of The Sierra Madre in his future, but his work in Falcon is…corny alert…the stuff that dreams are made of. And then Ward Bond follows with “huh?” See? Great follow-up line. Attaboy, Wardo!